If you are looking for a rug reminiscent of animals you would see on a Wildlife adventure, our Safari Collection is perfect for you. Each rug makes you feel as though you are in the wild with beautiful animal prints and safari-inspired motifs. 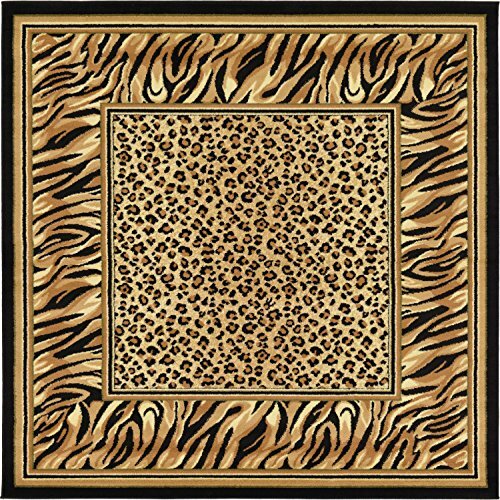 This Wildlife rug will make a bold statement in your home’s decor. Made in Turkey, this Unique Loom Wildlife Collection rug is made of Polypropylene. This rug is easy-to-clean, stain resistant, and does not shed. Colors found in this rug include: Light Brown, Black, Cream, Green, Tan, Light Brown. The primary color is Light Brown. The measurements for this rug are: 6 feet wide by 6 feet long. Features an Allover striped pattern. Has a border. Abstract style.